Also known as "Southern Balsam," this stately fir, native to the Great Smokey Mountains of western North Carolina and eastern Tennessee, is closely related to its northern counterpart Balsam Fir. Its soft, emerald green needles with silvery undersides are about three-quarters of an inch in length. Its bottlebrush texture, sturdy branching, traditional fragrance, and outstanding needle retention make it a superb Christmas tree. Native to the Adirondack Mountains, Balsam Fir is known for its soft, dark green foliage with flattened needles about three-quarters of an inch in length. Its distinctive aroma is widely recognized as the smell of Christmas . 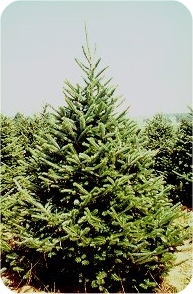 Its sturdy branched and excellent needle retention have made it a longtime favorite Christmas tree. 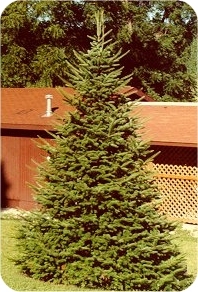 Found widely within the Canaan Valley of northeastern West Virginia, this tree is a genetic variation of traditional Balsam fir. Although similar in appearance to the traditional sources, its needles tend to be longer, about one inch in length, and vary more in color. 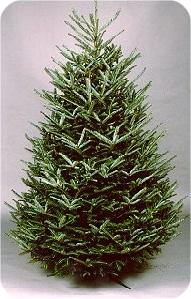 Its foliage, however, can often retain the bottlebrush appearance of Fraser fir, its southern counterpart. Relatively new to the Christmas tree industry, its popularity continues to rise because of its traditional Christmas fragrance and good needle retention. More commonly known as White fir, this evergreen is widely distributed throughout the southwestern United States from the Rockies of Colorado, and New Mexico in the east to California's Sierra Nevada range in the west. Is soft, silvery-blue foliage with flattened needles about two to three inches in length has a distinctive citrus aroma. 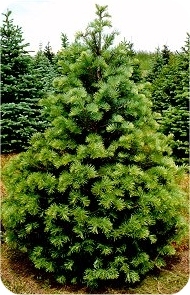 Its outstanding color and excellent needle retention make it an increasingly popular Christmas tree. sharp, blue-green foliage with needles about two to three inches in length are trimmed to a tight conical shape. Its perfect shape, excellent color and needle retention have made it a traditional choice for decades.